The SLM 4048 AE benefits from a 2 year warranty. Battery-powered products are not just environmentally friendly, quiet and easy to use but offer the same performance as petrol. 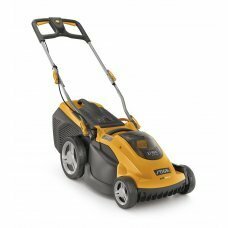 The STIGA SLM 4048 AE Lawnmower is powered by a class leading 48 Volt Lithium-Ion battery, with lightweight high performance cells delivering long run times. With no mains electric cable to drag behind you or get snagged in plants and garden furniture, simply plug in your battery and you're ready to mow. Supplied with a powerful 48 Volt 5Ah battery, you can easily mow a garden up to the size of 500m² on just one charge. The DigiTorq brushless motor has intelligent energy-saving technology to deliver guaranteed power every time. The underside of the cutting deck features an anti-scalp comb which improves the cutting finish and enhances collection. Cutting heights range from 25-75mm with 6 settings and single point adjustment. The SLM 4048 AE is a 3 in 1 mower - it can collect in its 40L capacity collector, rear discharge the grass clippings with the grass deflector flap in position or mulch the clippings using the mulching plug supplied. The collector has a vision window so you can clearly see when your mower needs to be emptied. With no cable or fuel worries, the virtually silent, stylish and easy to use SLM 4048 AE is a natural choice, and a great introduction to a range of superb battery powered garden tools.